Leroy Sane rebutted the suggestion that he could make a shock move to Manchester United and insists playing for Manchester City’s rivals is not something he ever expects to do. City boss Pep Guardiola said the club is working on a new contract for Sane, whose current deal expires in 2021, but reports in the media surfaced linking the 22-year-old with a potential move to Old Trafford. United have scored 14 fewer goals than City in the Premier League this season and the addition of Sane would significantly boost their attacking threat, but the Germany international was unequivocal in his response to the suggestion of what would be a controversial move. ‘That won’t happen! That won’t happen,’ Sane told reporters after completing the scoring in Sunday’s 6-1 thumping of Southampton. ‘That won’t happen at all,’ he added, when asked if a move to United might occur in the future. 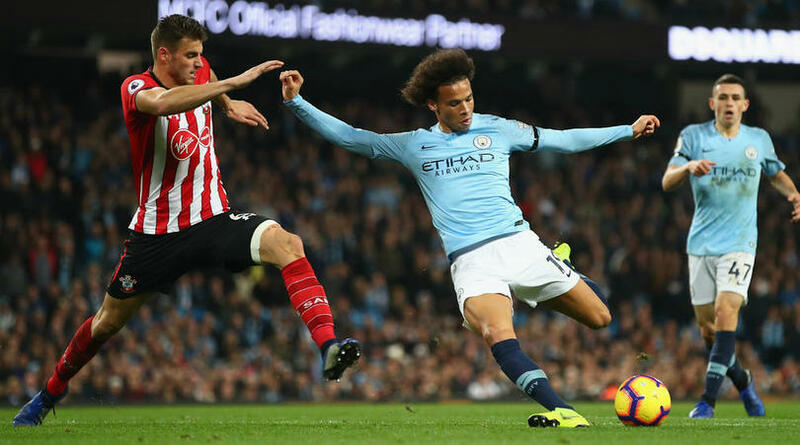 Sane has scored three goals in nine Premier League appearances this season and, after playing a starring role in the win that placed the champions back on the top of the table, he spoke about the importance of numerous players sharing in the responsibility for scoring. Sergio Aguero is City’s leading goalscorer in the league with seven, closely followed by Raheem Sterling on six, while Sane is on course to match or better his 2017-18 tally of 10 in 32 league games. ‘It’s so important not to just have one or two players who score the goals,’ said Sane. ‘Maybe one day they don’t score, and then the team doesn’t score at all.